Freaks! is a unique collection of just under 50 short stories, written in collaboration between Nik Perring and Caroline Smailes, with illustrations from Darren Craske. These tales contain some of the weirdest and most wonderful characters. From zombie hairdressers rekindling their passion for life, mermaid women and killer teenagers to stalkers and split personality mothers. Each of these stories begins with a speech bubble explaining the superpower behind the character. These include the ability to see the truth, amplify memories, read minds and see thoughts of others, converse with insects and create additional copies of oneself. Almost every tale is also illustrated with at least one amazing image by Darren Craske. My personal favourites accompany the sadder stories as he really captures the pain of the characters. I also adore the cover itself, it really is an eye-grabber. 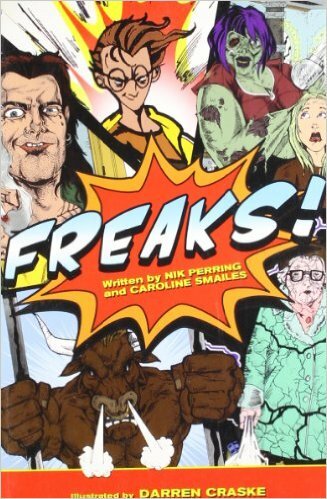 Due to The Friday Project publishing this collection of short stories, I was expecting Freaks! to be an absorbing, quirky and surreal combination of superheroes. I wasn’t to be disappointed. What I didn’t expect was the philosophical undertones, statements about how we treat people and how people appreciate different aspects of life. In the wrong place, this could come across preachy, in the right place, such as this collection, it just adds great depth to an excellent collection. For any alt/indie reader, this quirky collection with hidden depth is unmissable.